Governors and premiers representing states and provinces surrounding the Great Lakes did not discuss the piles of petroleum coke on the Detroit River when they met on the weekend. Premier Kathleen Wynne attended the Council of the Great Lakes Governors Summit and said it didn't come up. "But our Ministry of the Environment is involved with the government of Michigan," Wynne said Sunday during a stop in Windsor. "It really is an issue for them to resolve." Last week, Michigan U.S. 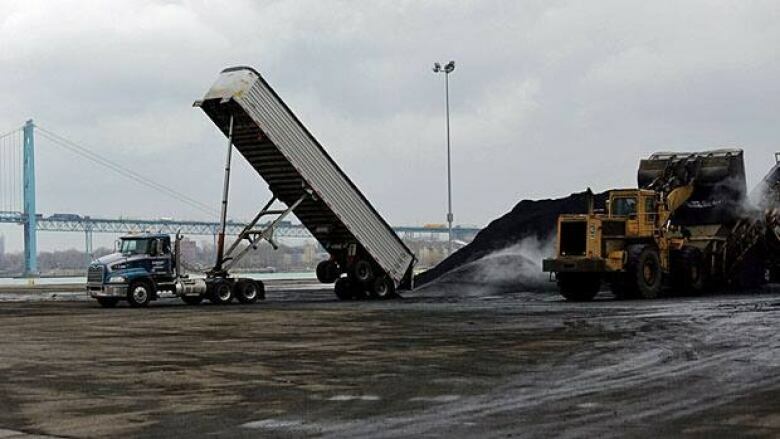 Congressman Gary Peters called on Washington to conduct a complete health review of petroleum coke, commonly known as pet coke. Prior to the summit, Peters and Masse sent a joint memo to the Great Lakes governors and premiers urging them to discuss the issue. Pet coke is a byproduct of oil refining. It is used mainly as an energy source, similar to coal, and is burned mainly in countries overseas. Peters and Masse believe the current storage of the product in Detroit is inadequate and potentially unsafe.